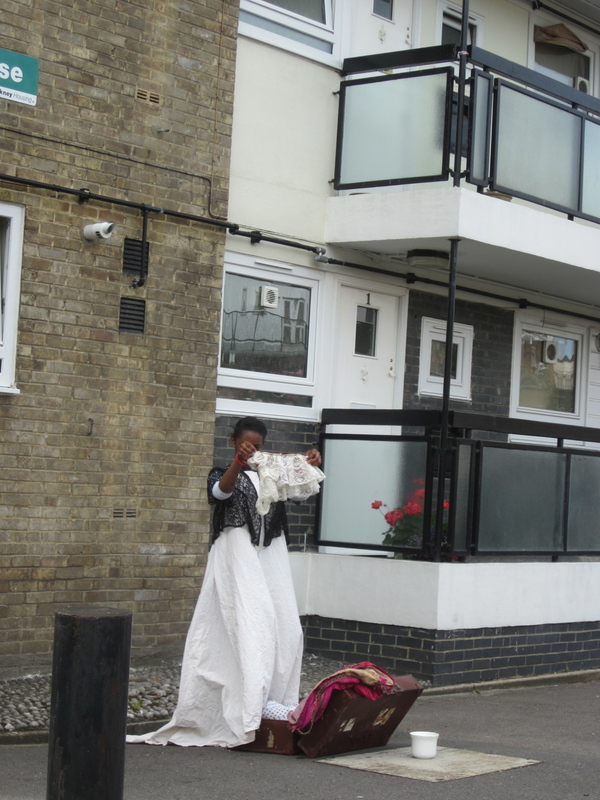 On 11 August 2012 a performative guided walk and corresponding exhibition invited audiences not only to learn more about Hoxton factually, but asked them to re-see, to look again and perhaps experience a different perspective of an area they might think they know. The project is a result of a partnership between local artist Dustin O’Hara – invited by PEER Participate to develop a project with local residents – and Access All Areas’ Black Cab Theatre Company; an ensemble of actors with learning disabilities. As a relatively new resident of the Cranston Estate Dustin O'Hara began a series of conversations with residents of Hoxton Street to uncover more about the local area, inviting those he met to take him on a ‘typical’ walk. 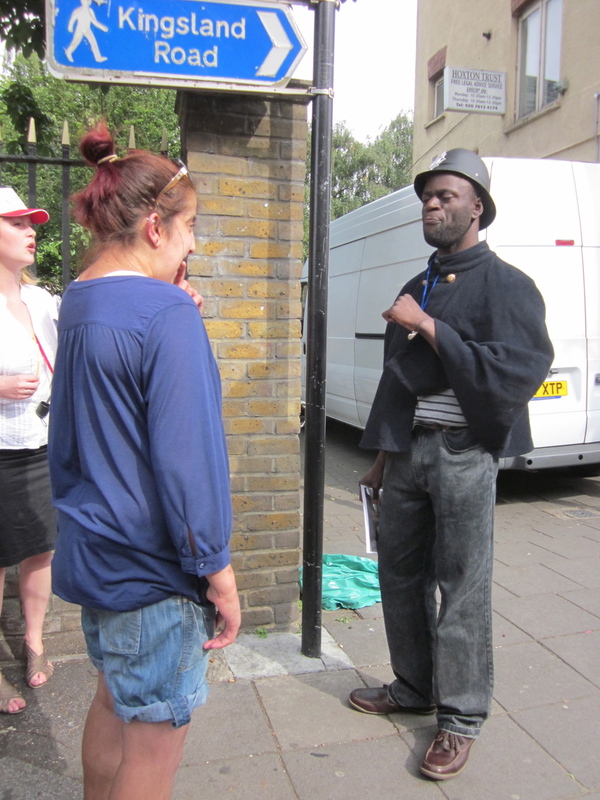 These encounters with the community brought him into contact with the Black Cab Theatre Company who were simultaneously involved in a study of the area’s rich social and cultural make up, past and present, and who wanted to bring people with learning disabilities to the forefront. Their investigations have been fruitful. From major historical events such as the uncovering of the Gunpowder plot on Hoxton Street, to the little known landmarks, such as the washer women’s grooves in Ivy Street. Perhaps most moving of all has been the sheer diversity of people that have become a thread in this rich tapestry. From the Young British Artists of the 90s to the generations of bakers; how do residents’ perspectives differ? What is seen by one person but never noticed by another? The exhibition at PEER comprises two different rooms presenting the group’s process and final product. Room One presents a wall drawing of the surrounding area, which visitors are invited to add to and a video documenting research alongside stories told by local residents during the Shoreditch Festival. You will also find a series of key objects connected to a selection of the stories discovered. Room Two presents a film installation offering a different perspective of the guided walk. A special project website: www.meyouhoxtontoo.net will provide further information on what Me You Hoxton Too has unearthed as well as being an online resource for profiling other like minded initiatives and contextualising this work within socially engaged and participatory practices. 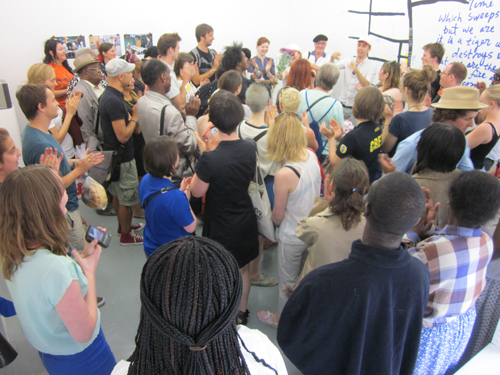 Me You Hoxton Too has been generously supported by the Paul Hamlyn Foundation and the Big Lottery Fund. The project has been made possible thanks to the stories and generosity of: Sue at Hayes & English, Sonia & Jesse, Mark Brooks of Brooks’ flower stall, Ibkun, Elsie Pilbeam, Linda Anderson, W. Lawrence Carpets, Hoxton Hall and The Laundry Rooms.